Lanzini double sinks woeful Blues. Oumar Niasse scored a fine goal to give Everton late hope at the London Stadium, but it wasn’t enough to deny David Moyes his first victory over Everton since leaving the club. For Everton, this was another poor away day showing to bring the curtain down on a simply dreadful season. This Sunday season finale between the ‘Ammers and Toffees had all the makings of an end-of-season snoozefest. With David Moyes contract as manager of the East London club definitely ending this week, he had successfully completed the task for which he was employed, namely maintaining the ‘Ammers Premier League status for at least one more season. A win in his final home game against the club where he enjoyed his best period in management was the obvious spur for the Scot. For the likely final game of his West Ham career, Moyes selected his starting eleven: Adrian, Rice, Ogbonna, Cresswell, Zabaleta, Noble (c), Kouyaté, Joao Mario, Masuaku, Lanzini and Arnautovic. Opposite number Sam Allardyce is also in fear of being unemployed again shortly, but he has the cushion of a contract termination payment to fall back on while laughing all the way to the bank. 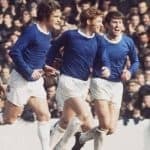 Even more unpopular amongst Evertonians as he was with the ‘Ammers supporters, it was a quirk of fate that saw potentially his final outing as Blues manager in front of two sets of fans united in their dislike of him. That said, Allardyce is thick-skinned and would have wanted victory over his former club in exactly the same manner as Moyes. For the last time, at least this season and without Wayne Rooney to select, he opted for a line-up of: Pickford, Baines, Keane, Funes Mori, Jagielka (c), Coleman, Schneiderlin, Gueye, Davies, Tosun and Niasse. Our final referee of this easily forgettable season was Graham Scott. West Ham enjoyed much the better of the opening to the game with Masuaku keen to throw crosses into the box looking for Arnautovic to put pressure on the back three, but the first real chance went to Noble bringing a superb save out of Jordan Pickford diving low to his right after Arnautovic had fed the West Ham captain inside the area. The Blues first forward move saw Davies find Tosun who repaid the compliment to present Davies with the chance to shoot, but he seemed to be in two minds and completed neither a shot nor a pass to Gana Gueye and the home side were able to clear their lines easily. A foul on Niasse earned Everton a free kick on the left that came to nothing and then Funes Mori was booked shortly after for a foul on Masuaku who needed treatment as a result. Masuaku subsequently was substituted by Fernandez on twenty minutes. Keane released Coleman down the right but his cross for Tosun was just too strong and Gueye was unable to control the loose ball. West Ham responded with Lanzini finding Joao Mario and he fired a low shot that went just wide of Pickfords’ left hand post. Tempers rose a bit just before the half hour mark as Niasse went in on Adrian as the goalie cleared and some handbags, push and shove followed with referee Scott giving Seamus Coleman a bit of a talking to. Everton had a glorious chance to open the scoring as a shocking back header by Ogbonna allowed Niasse to go in one-on-one with Adrian, but the finish was poor and Adrian saved easily with his legs. Niasse was ever the willing runner and when Baines found him, he turned well to get a shot away that again Adrian made the save on, but at last Everton were beginning to impose themselves on proceedings. Lanzini needed treatment for a challenge by Funes Mori and after returning to the field he bagged the opening goal. Kouyate found Arnautovic who quickly found Lanzini to fire a daisycutter into the bottom left hand corner beyond the reach of the diving Pickford on 39 minutes. Arnautovic got caught in the nether regions as he closed in on Pickford who raised his left knee in self protection and wasn’t very impressed by the actions of the Everton goalie. Baines cleverly got away from Zabaleta to find Tosun who set up Davies for the shot that sadly rose to clear the bar. Arnautovic was lucky not to see yellow for following through on Phil Jagielka as the first half drew to a close, a half that West Ham had had much the better of and deservedly led one-nil at the break. Davy Klaassen appeared for the second half at the expense of Funes Mori as Sam Allardyce reverted from a back three to a four with the Dutchman employed to strengthen the midfield that Lanzini in particular had dominated in the opening period. Everton wasted another corner so little change there from the rest of the season – quite what goes on in training on set pieces at Finch Farm is utterly baffling. The home side were again enjoying the better of the opening stages and Cresswell wasted a free kick firing over after Keane had fouled Kouyate. Davy Klaassen tried his luck with a 25-yard volley that went straight into the arms of Adrian. Theo Walcott came on for Cenk Tosun on the hour mark and the Turkish forward was furious at the hook and reacted angrily arguing with Seamus Coleman and ignoring both Allardyce and Ferguson as he left the pitch. WestHam doubled their lead on 63 minutes as Arnautovic got away from Keane and crashed in a fierce shot that Pickford will probably be very self critical of himself for not doing better with. Arnautovic was denied a second marker when he was rued offside after burying a header from a Cresswell cross on 68 minutes and that signalled the departure of a number of the travelling fans and let’s be honest, who could blame them for leaving early. Oumar Niasse was unlucky to see a decent shot pushed onto the post by Adrian to raise faint hopes of a fight back, and from a Baines corner moments later, Schneiderlin headed back into the six yard area where Niasse gathered the ball, turned and fired high past Adrian to reduce the arrears with sixteen minutes left on the clock. West Ham secured the three points on 82 minutes as Lanzini fired home his second of the game and once again, Jordan Pickford will be disappointed with himself for not doing better. Bolasie came on from Tom Davies ahead of the restart. Everton were denied twice in the dying minutes as Adrian made saves with his legs from Walcott and then pushed a shot from Niasse over the bar, ahead of Lanzini getting a standing ovation from the home fans as he was replaced by Obiang. James Collins came on for a cameo appearance for West Ham, announced on the public address system as the ginger Pele – strange these West Ham folks. In added on time, Arnautovic again got away from Keane who got back to push him over, but the referee waved away penalty appeals from the home side. It gives me no pleasure to say thank heavens that this dogs breakfast of a season has finally ended. Right from the very start, the standard of football served up by the boys in Blue has been largely dire with only the odd, fleeting high points. The club, in so may areas is in desperate need of serious, serious re-evaluation and change, not least in terms of the manager and it is to be hoped that those who walk the corridors of power act and act decisively throughout the close season… starting tomorrow morning. A massive thanks to everyone who votes and has voted in the MotM polls today and throughout the season, and I hope we can all enjoy the summer.